On Saturday my dear friend got married in a small outdoor ceremony. 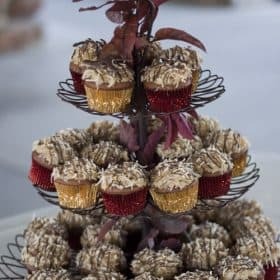 She liked the popular idea of doing cupcakes instead of a traditional wedding cake and asked me if I’d bake them for her. Of course I was honored to bake them and to be a part of her special day. 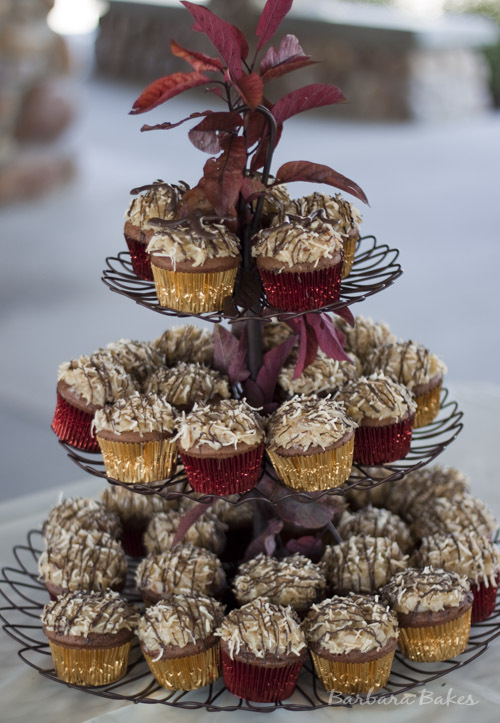 She chose fall colors for the wedding and we thought German chocolate cupcakes would be a perfect fit. I used our family favorite Easy German Chocolate Cake recipe and dressed it up with a sprinkle of toasted coconut and a drizzle of chocolate on top. 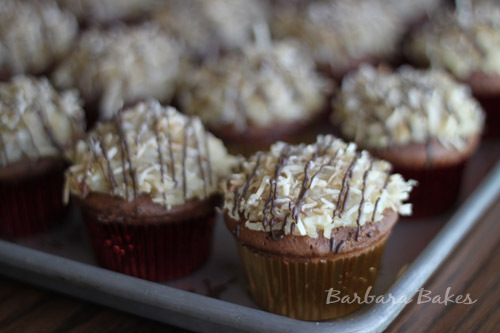 I baked them in red and gold foil cupcake liners and they really were a perfect fit for the season. Congratulations Karen and Mark! I wish you a lifetime of happiness together! Preheat oven to 350º. Line cupcake pans with paper liners. Bake for 20 to 25 minutes or until toothpick inserted in center comes out clean and the cake springs back. Remove from oven and cool for 5 minutes. Remove from pans and cool on a wire rack before frosting. Can also be baked in two 9 inch round pans for 30–35 minutes, or 13 x 9 baking dish for 38–42 minute.